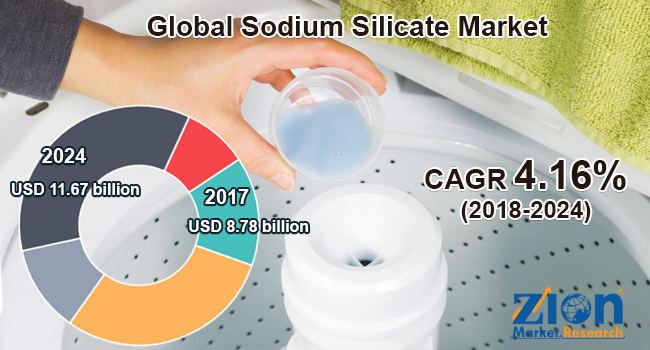 Zion Market Research has published a new report titled “Sodium Silicate Market by Type (Solid Sodium Silicate and Liquid Sodium Silicate) and by Application (Detergents, Construction, Paper & Pulp, Water Treatment, Metal Casting, and Others): Global Industry Perspective, Comprehensive Analysis, and Forecast, 2018—2024”. According to the report, the global sodium silicate market was valued at approximately USD 8.78 billion in 2017 and is expected to generate around USD 11.67 billion by 2024, at a CAGR of around 4.16% between 2018 and 2024. Sodium silicate is a chemical compound, which is mainly composed of sodium and silicon. Sodium silicate is soluble in water. They are either clear liquid form or transparent powders. It is generally composed of oxygen-silicon polymer water in molecular matrix form. The sodium silicate market is likely to be driven by the growing demand for sodium silicate as an adhesive in the paper and pulp industry in the upcoming years. Moreover, the growing demand for sodium silicates for manufacturing detergents as a bleaching agent is likely to further propel the sodium silicate market in the future. Sodium silicate chemical compounds are manufactured in the form of thick liquids or solids and are used in a diverse range of applications, such as passive fire protection, formulation of cement, manufacturing of refractory ceramics, textile, and lumber processing as adhesives. They are also utilized to produce silica gel. Due to the diverse and wide range application of sodium silicate, the demand for the chemical compound is likely to increase in the future. These are some factors expected to drive the sodium silicate market over the estimated timeline. By type, the sodium silicate market is bifurcated into liquid sodium silicate and solid sodium silicate. Liquid sodium silicate segment is expected to dominate the sodium silicate market, owing to its growing demand in the paper and pulp industry as an adhesive. By application, the sodium silicate market includes detergents, construction, paper and pulp, water treatment, metal casting, and others. The construction segment is likely to dominate the sodium silicate market in the upcoming years, as they are widely used as a sealant for concrete mixtures. North America, Europe, Asia Pacific, Latin America, and the Middle East and Africa comprise the regional segment of the global sodium silicate market. Asia Pacific region registered the highest rate of growth in the global sodium silicate market in 2017. The region is expected to continue its regional dominance in the upcoming years, owing to the increasing constructional activities across the region. Rising disposable income, growing demand for smart building, and increasing infrastructural developments are some other factors predicted to further drive this regional market over the forecast time period. The European region is predicted to provide significant growth opportunities in the sodium silicate market in the years ahead, owing to the growing demand for sodium silicate in the paper and pulp industry as an adhesive, which is likely to propel this regional market. Some industry players operating in the sodium silicate market include Evonik Industries, Nippon Chemical, PQ Corporation, Huber, PPG Industries, BASF, W.R Grace & Co., Oriental Silicas Corporation, Albemarle, Tokuyama Siltech Co., Ltd., Silmaco NV, OxyChem Corporation, and Occidental Petroleum Corporation.